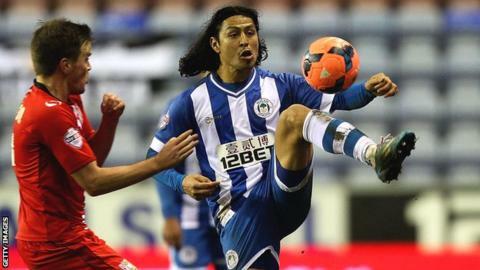 Wigan's Roger Espinoza has had surgery on a hernia problem, but is expected to return before the end of the season. The versatile Honduras international, 27, has appeared 25 times for the Latics this term, scoring once. "We expect him back pretty soon. Hopefully he will be involved in some games before the end of the season," boss Uwe Rosler told the club website. Wigan have also lost midfielders Chris McCann and Ben Watson to serious injuries in recent weeks. Both McCann (fractured knee cap) and Watson (broken leg) will miss the remainder of the season. The FA Cup semi-finalists have won their last seven matches in all competitions and travel to Ipswich in the Championship on Saturday.